Truffles By Tate & Co.
Eric and his family's beloved dog, Tate, was originally trained as a military dog to find bombs and other substances, but living in the South, he was also trained to be a hunting dog. He proved to be a uniquely enthusiastic learner. Through the encouragement of Dr. Tim Brenneman, Professor of Plant Pathology with the University of Georgia, who actually discovered pecan truffles in Georgia in the late 1980's, Tate's trainer began to see if he could find pecan truffles in South Georgia. Tate was successful in this experiment and really enjoys the challenge of finding truffles. Eric and his family also love the experience of finding truffles with Tate. Eric started this new adventure as a project for his two young children to learn how to work hard and learn responsibility. 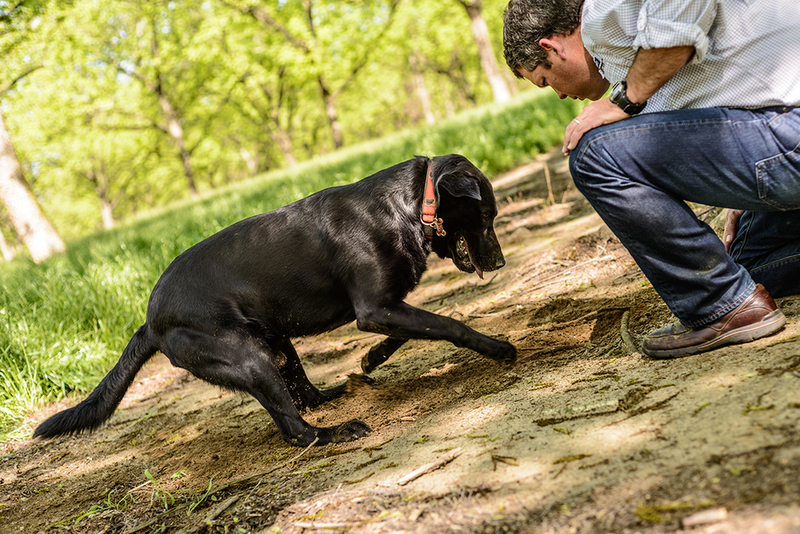 During truffle hunts, his family enjoys meeting new people and sharing the amazing experience of how Tate is able to find tiny pecan truffles in a huge pecan orchard. It is truly impressive. Pecan truffles (Tuber lyonii) are actually mushrooms that grow just underneath the ground along the roots of pecan trees. Truffle season is from late July through November. Mainly used by chefs in pasta dishes and meat dishes, Pecan Ridge truffles have been featured in high-end restaurants in Georgia, such as Liam's in Thomasville and The Spence in Atlanta, and have been used in upscale restaurants in other states as well. Many individuals with discriminating culinary interest also enjoy using pecan truffles for their own personal cooking experiences. To inquire about scheduling a truffle hunt or how to purchase pecan truffles, please call or email Eric Cohen at (229) 220-6208 or ecohen1137@gmail.com. Call Eric at (229) 220-6208 to schedule a private truffle hunt. Truffle season is generally from July-October; however, this is dependent upon weather conditions. Pecan Ridge Plantation was recently featured in "Garden and Gun" magazine. Click here to read the article.